Hailing from just outside Atlanta, USA, Competition Clutch is a performance clutch manufacturer on the up. They are the fastest growing performance clutch company in North America so they must be doing something right. Here at Tarmac Sportz, we’re excited to feature their high-quality performance clutches in our range. They have a commitment to quality and innovation that they contribute this dizzying growth to. They complement this with a firm commitment to fantastic customer service and delivery. Competition Clutch are specialists in the production of clutches for cars of all sorts, from street drivers to track and rally racers. You will find our products being proudly used in some of the fastest sport compact race cars in the country, including a number of the most recognized industry icon vehicles. Competition Clutch brings to their customers the finest materials, workmanship, and the best customer service in the industry. Competition Clutch offer higher clamping force, stronger disc designs, and uncompromised satisfaction, all at the most competitive pricing in the industry. Enhance your car’s performance and drivability with a clutch from Competition Clutch. Competition Clutch’s range covers a huge variety of track, street and rally-appropriate clutches that are guaranteed to overhaul your car’s performance. The range has clutches for Stages 2, 3 and 4 clutch applications, and flywheels for a huge variety of car makes and models. The clutch kits are designed to be assembled easily. Stage 2 offers an 80% increase in torque capacity and ideal for aggressive street use and moderate track use, whereas Stage 3 offers an enormous 150% increase in torque capacity, perfect for street and strip. Stage 4 provides a monstrous 250% increase in torque capacity, supercharging your horsepower potential. 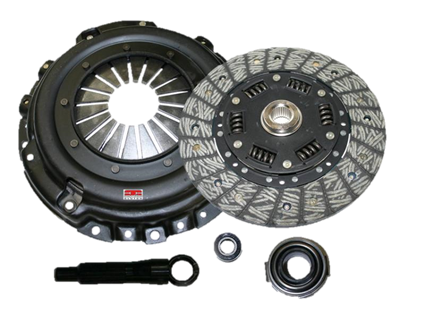 Clutches require a certain mileage of breaking in, which is stated on the product pages. The range includes flywheels of different weights to let you choose the one that works best for your needs. The lightweight flywheels have been designed for naturally aspirated engine driven cars and/or street driving. They allow for easy low-torque drivability. The ultra-lightweight flywheels are recommended for forced induction engines and/or rally and track driving. The number of racing teams Competition Clutch supply is nearly 20, ranging from circuit, time attack and drift, to drag and even rally. This has given the team at Competition Clutch frontline racing experience to improve and develop their clutch designs in the most extreme conditions. Racing experience means that Competition Clutch uses only the toughest materials in the production of their clutches and flywheels. They need to withstand the extreme conditions of high speed racing and materials like ceramic, segmented ceramic and 4140 forged steel are designed with strength and heat-resistance in mind. If these clutches are good enough for Charles NG Racing and Slide Motorsports, then you are guaranteed to notice a huge difference in your car’s performance. We’re sure you'll be able to find the perfect Competition Clutch for your street driving, racing and rallying needs.